A wedding at 250 LongPond is pure magic. Enjoy a long weekend exchanging vows and celebrating with loved ones surrounded by the spiritual energy and sheer beauty of a quartzite rock ledge. 250 LongPond offers a unique destination wedding experience, sleeping 35 people comfortably. We generally recommend for the bride and groom to stay in the guest house for privacy, and for the rest of the wedding party to reside in the main house and/or barn. With our 12 large sleeping rooms in 3 dwellings, totaling over 15,000 square feet of living space, including our 3000 square foot modern barn, 250 LongPond is the ideal destination for an unforgettable multi-day wedding! For those that would like piece of mind, we have a partnership with fabulous local wedding consultant, Danielle Pellerin, who can help you plan your wedding from A to Z. We also have a list of best in class preferred vendors we can recommend. We do not generally rent our estate for 1-day events. A 3-day minimum is required during high season from May to October. 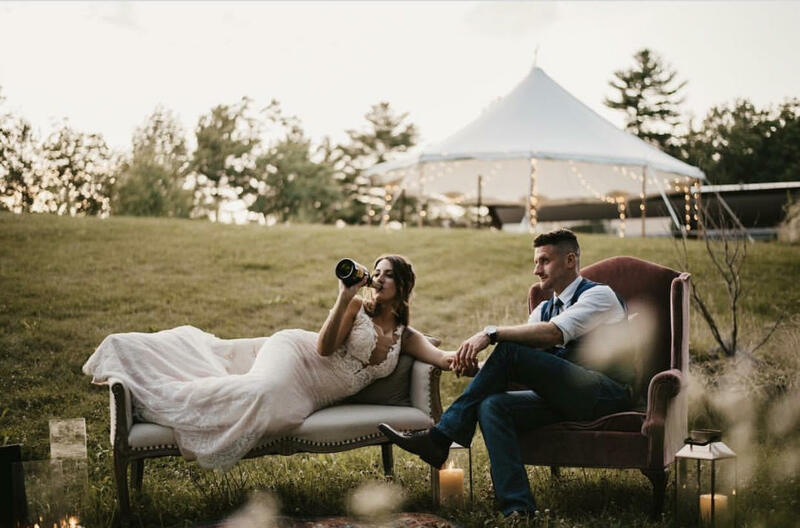 Have your ceremony in the forest by a scenic outlook, or a few steps from the 5 acre lawn around the house or barn, amidst rock ledges, riverside, on our beautiful deck, or wander our 120 acres of rock outcropping and springs and the Williams River for a unique spot that fits your wishes and personalities. Our Barn provides a lofty 3,000 sq. ft. space that easily adapts to each couple’s style. It looks great with wildflowers and burlap, or silks and exotic blooms. Couples can invite up to 220 guests to join them in celebrating their wedding. We encourage couples to pick their own outdoor ceremony space from either one of several areas that have been curated before with minimal customization, ready for a ceremony, or to explore our magical property for your own unique spot. We are happy to guide you based on your wishes. For a more intimate winter wedding of 100 guests or less, we suggest using the barn as a wonderful indoor option. 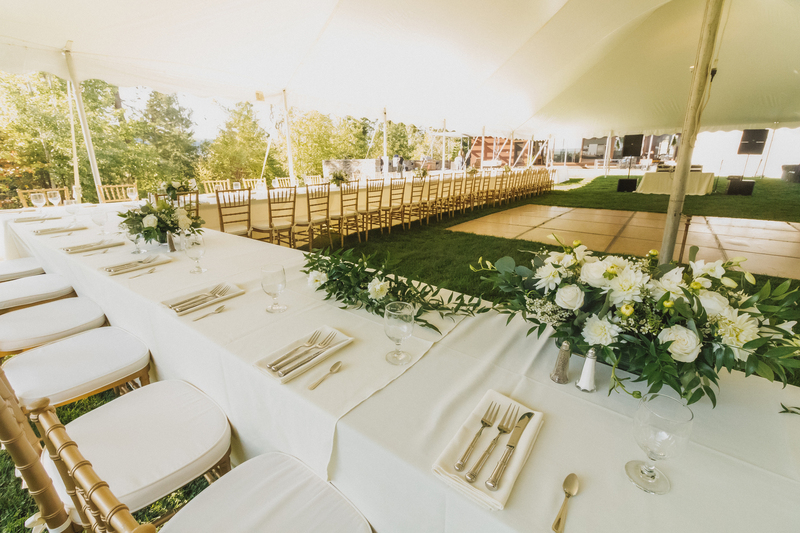 For spring, summer, and fall weddings, the lawn outside the main house is an ideal setting surrounded by the incredible property, and with beautiful views across the berkshires. There are so many wonderful options to choose from. Tents can be rented and placed on one of several flat lawn spaces. Our pricing is geared toward renting out the estate and its 3 dwellings for stays of 3 days or more. (Exceptions Nov-April during less busy season). The event fee is for the right to host an event with the number of people in your contract. You are renting the property and the dwellings, which come with all the comforts, furnishings, kitchenware and modern amenities you will need or want for a holiday gathering of 35 people plus or minus. 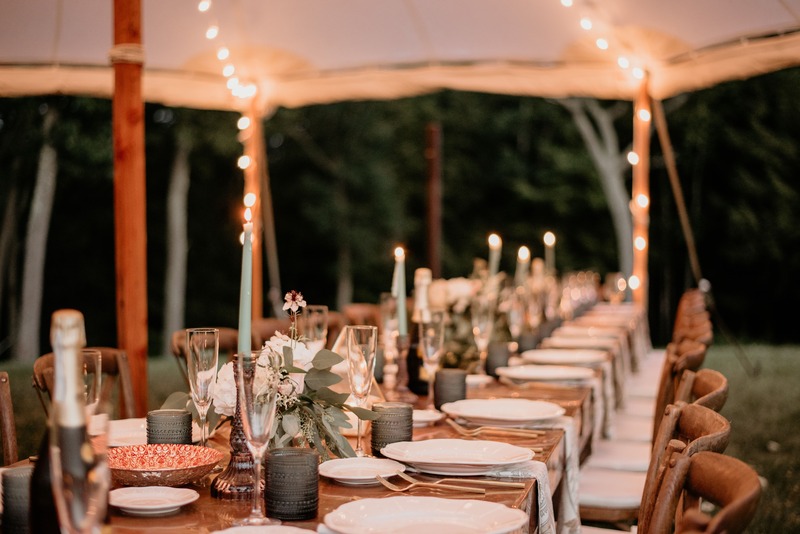 In terms of the added costs associated with a wedding or larger scale event (culinary needs/catering, tables and chairs, tent or outdoor structure, etc. ), those choices, and the costs associated with them, are up to the renters and their individual desires and not included in the property rental cost. We do have some beautiful handmade party related items in house including farm tables , signage, and hand made serving items that we can make available to rent, but nothing close to what a party rental company will offer. Long Pond is truly the ideal canvas on which you can create whateer your heart desires. 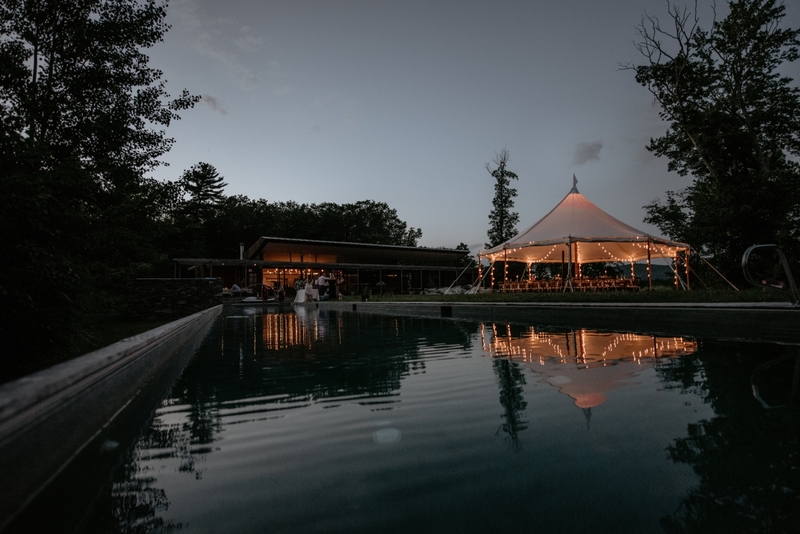 The indescribable, natural beauty at one with the thoughtful architecture at Long Pond lends itself to both a casual 40 guest barbecue, as well as a 220-person immaculate feast, with every detail finely planned and curated. 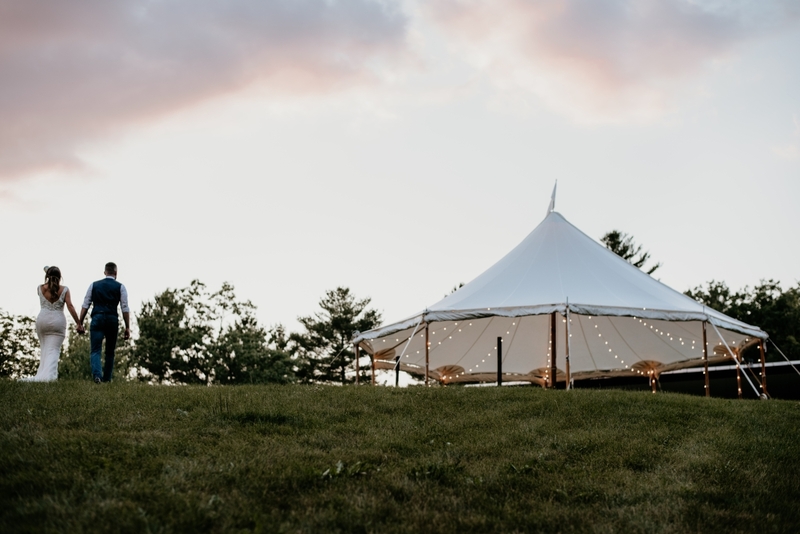 In addition to the rental fee we receive, we are aware of guests spending as little as 25 dollars a person and as much as 500 per person, so we don't try to predict what a wedding at Long Pond will cost. It's really up to you. What we do know is that couples who come here to celebrate their love with family and friends are given one of the most beautiful natural settings imaginable, alongside a home that can comfortably and luxuriously accomodate many, if not all, of their close family and friends. We are happy to assist in connecting you to our preferred vendor list in terms of all catering/event needs (tent tables, chairs, food, florists, photographers, and decor). The cost of the details of your wedding is not part of the event fee. Parking for up to 35 cars, or for up to 60 with valet, is available on site. Can we just rent the property for a day event? Not on weekends. Weekdays are up for discussion. Why is there a 3-day minimum? The property rents throughout the year for several days, even weeks at a time and turnover isn't an easy task. We are flexible on the minimum during the off season from November to Mid-May, but not during high season. Can we bring our own chef/caterer? Absolutely! And our in-house chef is happy to help your chef/caterer become aquainted with the property and to help receive equipment and deliveries ahead of time. Can we camp on the property? YES. There is a 30 dollar per person camping fee + 60 dollar per person event fee would apply. Please bring your garbage out of the site with you and leave behind only the natural beauty provided for you! Is there a local noise ordinance law or curfew? YES. The town of Great Barrington does have a__________. We suggest communicating with us in advance regarding your plans so that we can let the neighbors and town/police know ahead of time that there will be a celebration happening. The property is large so there are only a couple of neighbors to communicate with, but it's considerate to let them know ahead of time. Can we take the snowmobile out in the winter? NO, sorry, it's a huge liability. Are hiking trails well marked? Not really. There are trails on the property for your to explore. I put orange paint and ribbons on the trees. If you get "lost" then remember these things: Uphill takes you to the property or Long Pond Road. Downhill will take you towards Williams River and further from the property, so go back uphill to reach the house. If you come out on Long Pond Road or so far south that you can't see the house, turn right and you will get there. If you are far north you will walk into a steep cliff. Don't climb it. Just turn left and you will eventually come to the driveway or house. 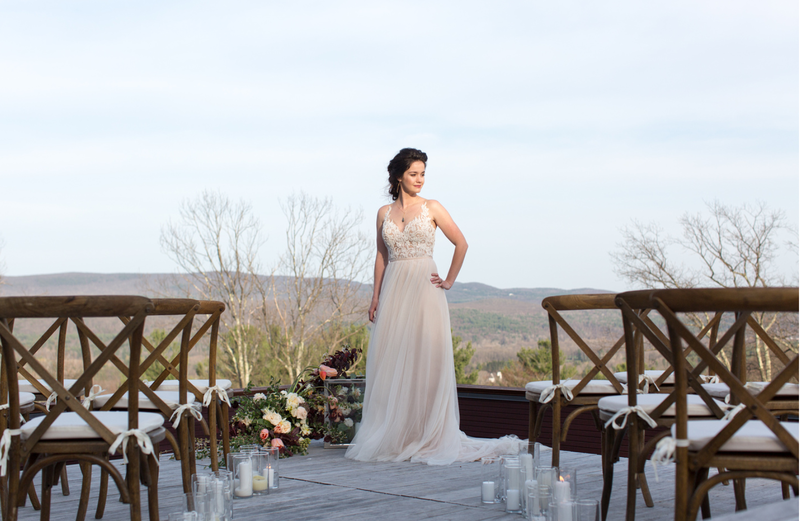 For more information on our Great Barrington, Massachusetts wedding venue, please fill out the form below or send an email to marketing@250longpond.com.